(Reuters) – Egypt was locked in a tense standoff on Monday after millions of protesters swarmed into the streets to demand the resignation of Islamist President Mohamed Mursi and militants set the ruling Muslim Brotherhood’s headquarters on fire. Young revolutionaries united with liberal and leftist opposition parties in a massive show of defiance on the first anniversary of Mursi’s inauguration on Sunday, chanting “the people demand the fall of the regime”. The demonstrations, which brought half a million people to Cairo’s central Tahrir Square and a similar crowd in the second city, Alexandria, were easily the largest since the Arab Spring uprising that ousted Hosni Mubarak in 2011. Mursi, the most populous Arab state’s first freely elected leader, stayed out of sight but acknowledged through a spokesman that he had made mistakes while adding that he was working to fix them and was open to dialogue. He showed no sign of quitting. The massive protests showed that the ruling Muslim Brotherhood has not only alienated liberals and secularists by seeking to entrench Islamic rule but has also angered millions of ordinary Egyptians with economic mismanagement. Tourism and investment have dried up, inflation is rampant and fuel supplies are running short, with power cuts lengthening in the summer heat. Dozens of militants attacked the Brotherhood’s national headquarters in Cairo with shotguns, petrol bombs and rocks, setting it on fire, and targeted offices of its political party across the country. There was no sign of police or fire service protection for the Brotherhood’s head office, where witnesses said guards inside the building fired on the attackers. Two people died and 11 were injured in that clash, hospital sources said. Protest organizers called on Egyptians to keep occupying central squares across the country in a campaign of peaceful civil disobedience until Mursi quits. 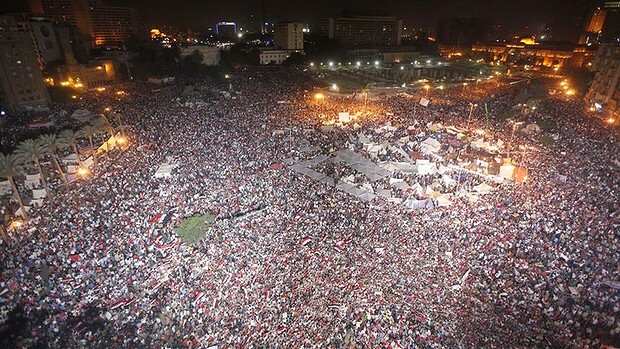 Tens of thousands of demonstrators stayed in Tahrir Square long after midnight, appearing to heed the call for a sit-in. That put the spotlight on the army, which displayed its neutrality on Sunday, making goodwill gestures to the protesters after urging feuding politicians last week to cooperate to solve the nation’s problems. Some uniformed policemen marched among protesters in Cairo and Alexandria, chanting “the police and the people are one”, and several senior officers addressed the Tahrir Square crowd. That cast doubt on whether Mursi could rely on the security forces to clear the streets if he gave the order. Diplomats said the army, which ruled uneasily during the transition from Mubarak’s fall to Mursi’s election, had signaled it was deeply reluctant to step in again, unless violence got out of hand and national security was at stake. While the main demonstrations were peaceful and festive in atmosphere, seven people were shot dead in clashes in the central cities of Assiut, Beni Suef and Fayoum and outside the Brotherhood’s Cairo headquarters. The Health Ministry said 613 people were injured in street fighting around the country. Women’s activists said at least 43 women, including a foreign journalist, suffered organized sexual assaults by gangs of men during the Tahrir Square rally. The opposition National Salvation Front coalition of liberal, secular and left-wing parties declared victory, saying the masses had “confirmed the downfall of the regime of Mohamed Mursi and the Muslim Brotherhood”. Opposition leaders, who have seen previous protest waves fizzle after a few days in December and January, were to meet on Monday afternoon to plot their next move. Influential Qatar-based Muslim cleric Sheikh Youssef Qaradawi, visiting Cairo, appealed to Egyptians to show more patience with Mursi, while saying the president had made errors. Mursi and his Brotherhood supporters have so far rebuffed such pressure, arguing that he has democratic legitimacy and the opposition is merely seeking to achieve on the streets what it failed to secure at the ballot box. This entry was posted in Egypt : Democracy Movement. Bookmark the permalink.